Offer Expired! Used by 4 new players. Get 70/1 Liverpool, Everton, Chelsea & Tottenham all to win with this exclusive Ladbrokes ACCA promo code free bet bonus on Champions League football. To claim this 70/1 Champions League ACCA at Ladbrokes, you must deposit a minimum of £/€5 in to your account and place, as your first real money bet after opening your account, a single £/€1 bet on Liverpool, Everton, Chelsea and Tottenham all to win 70/1 in Ladbrokes' 'My Offers' section under the promo tab ("Qualifying Bet"). A bet will not be considered a Qualifying Bet for the purposes of this Sports Promotion if for any reason it becomes Void. On placing your Qualifying Bet, if Liverpool, Everton, Chelsea & Tottenham all win their respective matches you'll become eligible to enhanced odds of 70/1. Alternatively, if any of these teams fail to win will instantly credit your account with a £/€5 free bet. Where you "Cash Out" your Qualifying Bet prior to it being settled, no free bets will be credited to your account as part of this Sports Promotion. If your Qualifying Bet wins your winnings will be paid in cash based on the normal odds price on our Website and you will have your account topped up with free bets to reflect the enhanced odds you become eligible to under this Sports Promotion. All free bets will be automatically credited to your account within an hour of the final whistle. Free bets are limited to one per person, household (IP address) and/or computer, and/or payment method. Bet-Promotion-Codes.co.uk love a good Football enhanced promotion. 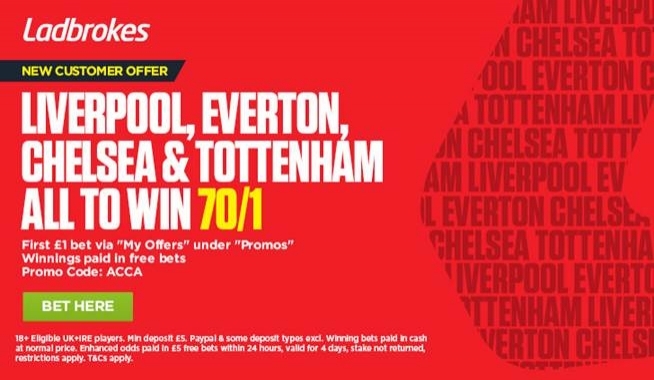 If this Ladbrokes Get 70/1 Liverpool, Everton, Chelsea & Tottenham All To Win offer doesn't temp you take a look at our other Football enhanced odds promotions available. There's something for everyone for everyone on Football betting.